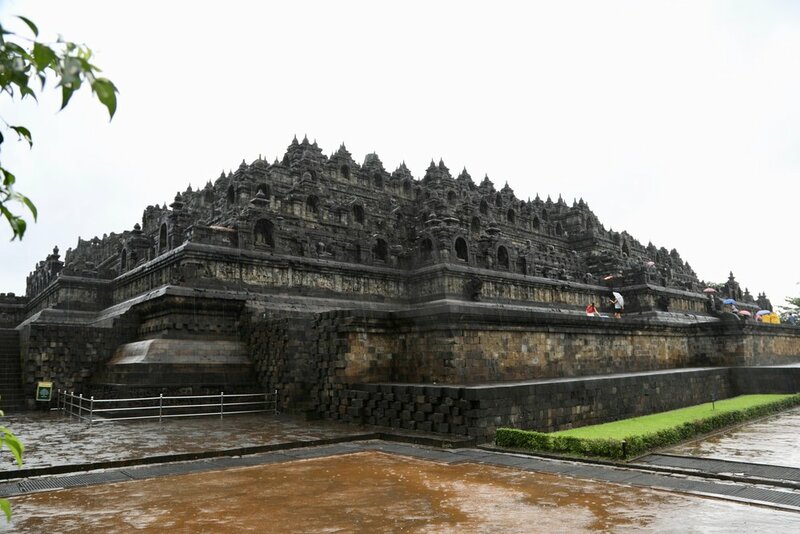 Deep in Central Java, in modern day Indonesia, lies the world’s largest Buddha site - Borobudur. What is it doing there? In the late 9th. Century the successful ruling dynasty of the region combined the indigenous cult of ancestor worship with the Buddhist concept of attaining Nirvana, employing Javanese Buddhist architecture, but this time on a grand scale. There are nine stacked platforms, six square and three circular, with a central dome on top. There are 2,672 relief panels, some in better condition than others, and 504 Buddha statues. Most are headless now, thanks to thieves, museums and private collectors around the world. What remains though is magnificent. It is huge, and feels masterful. Severe water erosion, high temperatures, the jungle, earthquakes and volcanic ash deposits have done their best over the millennium to destroy the Temple. Support from British then Dutch rulers, and later German and Unesco funding, have combined to preserve and sustain the site. Despite heavy rain when I visited, it still managed to enthrall me.